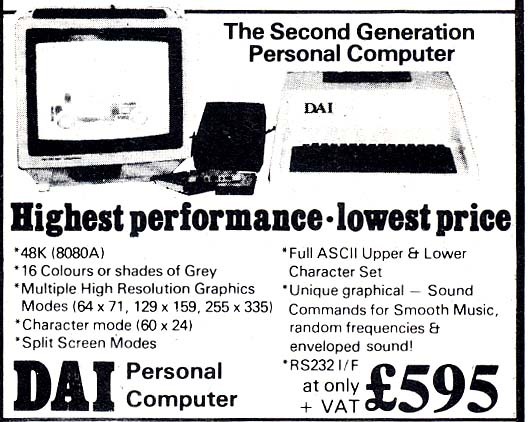 What is sometimes forgotten about the dawn of home computing is that there were a surprising numbers of ‘also ran’ technologies. For each success story like the zx spectrum or atari 2600, there were half a dozen other machines that were produced in small numbers, bought by unsuspecting suckers [or more likely, ill informed parents] which never quite took off. Here we take a look at a few of them, from 1981.
the worlds first welsh computer? £595 is no small amount of money, and in 1981 it would be considered a fortune. We’d better be getting something good for that kind of outlay. Let’s see 255×335 high resolution graphics, 16 colours, 48k of RAM. Not bad. But wait, there’s more “Unique graphical-sound commands for Smooth Music, random frequencies and enveloped sound!” – there’s nothing like ‘random frequencies’ to bring out the Kid 606 in us all. The worlds most advanced TV game. This entry was posted in Ads by retrogeek. Bookmark the permalink. 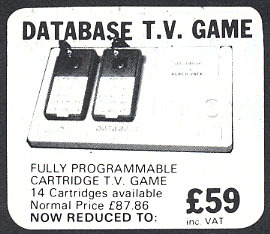 The “Database T.V. Game” is just awesome. my family had a database console but this is the first time i’ve seen it on the internet. i was starting to think it was a false memory, so thanks. and yes, it was crap, thank god we got a spectrum. The Mattel was known as the “Intellivision” in the USA and was actually quite popular (~ 3MM sold) and had quite a few games if I recall — and better graphics than the 2600. 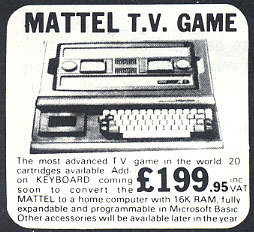 DOn’t knock the mattel..it’ was actually alright..well slightly better than the 2600.. some smug git brought one into our school once and we all went wow!